Starting now in Part II, I’ll talk directly to you the author about the mechanics of going wide. (Don’t ask many how many parts there will be… I’m a pantster). It’s a pretty broad topic, but I think I can boil it down to a few base topics. I’ll start with the really exciting stuff… file types! Okay, perhaps file types leaves you cold, but your emotional response to the topic (anger, fear, boredom, etc.) doesn’t make it irrelevant. Even if you pay a service to manage the publication files for you, it’s helpful to know enough to make sure you get what you need. What about PDFs? The PDF file format isn’t really an ebook format, though you can read an ebook that’s a PDF. The key difference is that PDFs are like a printed page, just still on the computer. A PDF is locked into a certain format and page layout, just like a printed page. You can zoom in on a PDF to make it larger, but it’s like lifting the printed page closer to your eyes. eBooks, on the other hand, are more flexible. You can increase the font size on your Kindle (and keep increasing it more with every passing year), and the whole book will be displayed differently on the fly. The ebook will suddenly have more pages to fit all the words when you increase the font. Or you can shrink the spacing between the lines. Or tighten the margins. Or change the font. You get the idea. An ebook adapts to the reader’s needs. In my opinion, this flexibility is an attribute that is far superior to printed books (though printed books have some advantages as well!). All that to say, our file types are MOBI and EPUB. PDF is over in the corner feeling sad, but we’re moving on. 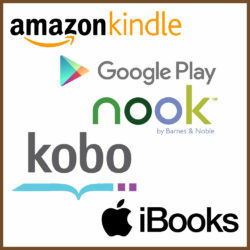 To go wide, your readers will generally read your book formatted as either a MOBI or an EPUB, however you got there. These file types are not like a text document, or even a Word document. If you crack open a MOBI or EPUB, you’ll find something that looks more like a directory full of lots of different smaller files. If you know anything about websites, an ebook looks sort of like that. There might be some image files, some files full of text that point to each other in a certain order, and other pieces. So you’ll ultimately be selling both MOBIs and EPUBs when you go wide, but how do you get there? Sounds like a good Part III. See you there, and don’t forget to ask questions you’d like me to consider in the comments. I’ve heard about Draft 2 Digital and Pronoun, services that publish “wide” and do the formatting for you. Do you have any thoughts about that? Experience with one or the other? Yes. Experience with both. I’ll start in on those in part 4, I believe. Thanks for asking. Previous Previous post: Going Wide, Part I – Wide vs… Narrow?